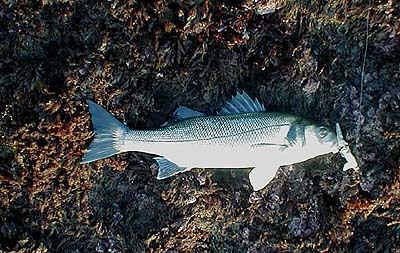 Once or twice recently I have mentioned fishing in tide races for bass. One of the spots I have been trying this year can only be accessed for a short time on the ebb. 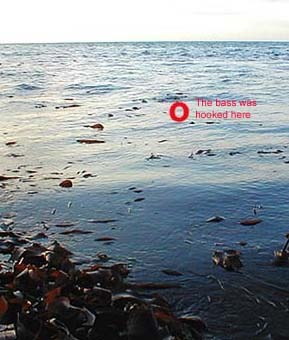 As the tide falls to its lowest point the shallowly covered kelp begins to break the surface and diving lures are constantly catching in the fronds. 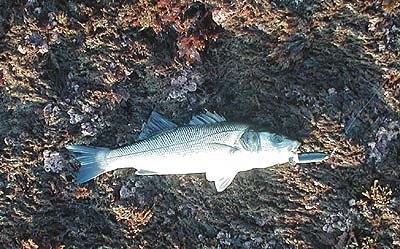 To counteract this problem it is possible to use surface lures, such as popping plugs or stick baits but I often have more confidence in a jointed minnow type of lure. Of course it is possible to buy lures such as the Thunderstick, which will fish pretty near the surface but recently I decided to make my own shallow diver. The stimulus for my bit of DIY was when, at the end of a recent bassing session, the lip broke off one of my J11's as it struck a boulder on the retrieve. I knew that I had another, identical, broken lure in the box and I decided to make myself a set. I have always wondered why Rapala don't market a shallow diving J13 and a deeper diving J11. I would certainly make good use of both. Anyway, I took my broken lures, yanked out the lips with pliers, cut grooves to take the new lips with a little hacksaw and trimmed up some bits of plastic bottle to make replacement lips (diving vanes). I mixed up a bit of Araldite Rapid, glued the lips in place, tied them on short lengths of thread and tried them in the bath. Both worked perfectly. On my next early morning session at the tide race I took both the spinning rod and the fly rod. When I arrived the tide was already well out and falling fast with weed showing at the surface. I started off with a streamer fly but the wind proved to be much too strong for my fairly limited casting ability. I picked up the spinning rod and on went my super-shallow-diver. I flicked it out five or six metres just to check if it would work and as I retrieved it was grabbed by a small bass which tore off into the race and gave me a real battle before I could land and return it. The lure obviously worked! Two casts later another fish was hooked and landed. No more bites were forthcoming in the next three-quarters-of-an-hour so I packed in and went home for breakfast. It's years since I bothered making my own lures but catching a bass on my modified Rapala brought back lots of the old satisfaction. The kelp is already at the surface as low tide approaches. 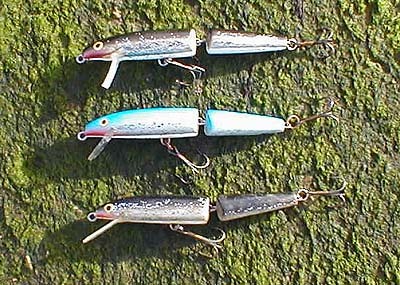 My range of lures for all situations, only the diving vane angles differ.